He grew up near the town of Isfahan , Persia , in the village of Jayyan . His father was the dihqan or chief of the village. He was the richest person there and had the biggest house. From Salman’s childhood, his father loved him more than he loved any other. As time went by, his love for Salman became so strong and overpowering that he feared to lose him or have anything happen to him. So he kept him at home, a veritable prisoner, in the same way that young girls were kept. He became so devoted to the Magian religion that he attained the position of custodian of the fire that they worshiped. Then he encountered some Christians and learned from them about their religion and embraced it. He was told that Christian religion had originated in Ash-Sham (Greater Syria). He did not go to his father’s estate that day and returned home at night. He told his father about his meeting with the Christians and how impressed he was by their religion. His father became upset and afraid that he would leave their religion. So he kept him locked up in the house and put a chain on his feet. Salman managed to unfetter himself and, in disguise, accompanied a caravan to Syria . He was directed to the bishop of the church and told him that he wanted to become a Christian and would like to attach himself to his service, learn from him, and pray with him. The bishop agreed, but later Salman found out that the man was corrupt. He would order his followers to give money in charity while holding out the promise of blessings to them and keeping the money for himself. After the bishop’s death, Salman continued in the service of the person who replaced him. The new bishop was an ascetic who longed for the Hereafter and engaged in worship day and night. Salman was greatly devoted to him and spent a long time in his company. After his death, Salman attached himself to various Christian religious figures, in Mosul , Nisibis and elsewhere. The last one told him about the appearance of a Prophet in the land of the Arabs who would have a reputation for strict honesty, who would accept a gift but would never consume charity (sadaqah) for himself. A group of Arab leaders from the Kalb tribe passed through Ammuriyah, and Salman asked them to take him with them to the land of the Arabs in return for whatever money he had. They agreed and he paid them. When they reached Wadi Al-Qura (a place between Madinah and Syria ), they broke their agreement and sold him to a Jew. Salman worked as a slave for him but eventually he was sold the man’s nephew who belonged to the tribe of Banu Qurayzah. This nephew took him with him to Yathrib (later known as Madinah), the city of palm groves, which is how the Christian at Ammuriyah had described it. At that time the Prophet was inviting his people in Makkah to Islam, but Salman did not hear anything about him then because of the harsh duties that slavery imposed on him. His master was very angry and gave him a terrible blow. “What does this matter to you? Go back to what you were doing!” he shouted. That evening, Salman took some dates that he had gathered and went to the place where the Prophet was staying. He went up to him and said, “I have heard that you are a righteous man and that you have companions with you who are strangers and are in need. Here is something from me as sadaqah. I see that you are more deserving of it than others.” The Prophet ordered his companions to eat but he himself did not eat of it. Salman gathered some more dates, and when the Prophet left Quba for Madinah, he went to him and said, “I noticed that you did not eat of the sadaqah I gave. This, however, is a gift for you.” Of this gift of dates, both he and his companions ate. The strict honesty of the Prophet was one of the characteristics that led Salman to believe in him and accept Islam. As a scholar, Salman was noted for his vast knowledge and wisdom. `Ali said of him that he was like Luqman the Wise. And Ka`b Al-Ahbar said, “Salman is stuffed with knowledge and wisdom like an ocean that does not dry up.” Salman had a knowledge of both the Christian scriptures and the Qur’an, in addition to his earlier knowledge of the Zoroastrian religion. Salman, in fact, translated parts of the Qur’an into Persian during the life-time of the Prophet. He was thus the first person to translate the Qur’an into a foreign language. Salman, because of the influential household in which he grew up, might easily have been a major figure in the sprawling Persian Empire of his time. His search for truth, however, led him, even before the Prophet had appeared, to renounce a comfortable and affluent life and even to suffer the indignities of slavery. 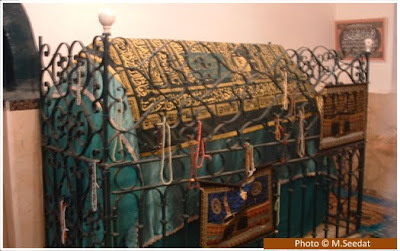 According to the most reliable account, he died in the year 35 AH, during the caliphate of `Uthman, at Ctesiphon.